You may never get to see your name up in lights but at least you can have every passing thought – or reminders to buy milk – illuminated. 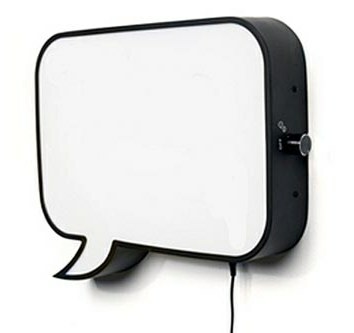 Designer Daniel Benito Cortázar has created a speech bubble wall lamp for Norwegian design collective, Northern Lighting. 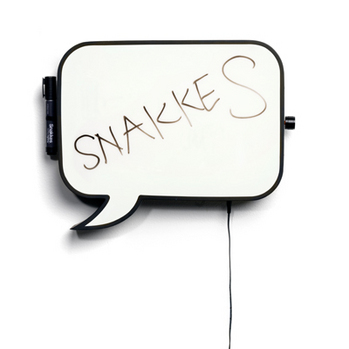 Named ‘Snakkes’, which means ‘talk to you later’ in Norwegian, the wall-mounted LED light board is also a whiteboard. Whilst a note reminding you to buy nappies is not all that glamorous, I’m sure there are plenty of sweet nothings, witticisms or cute comments made by the kids that deserve to be illuminated. The Snakkes light would certainly give a boy’s bedroom décor the ‘kapow’ factor. The lamp is £195 and is available from Funktionalley. Funktionalley do not ship to Australia, so a freight forwarder is required.